If you’d like a little help writing emails, Google’s got you covered. 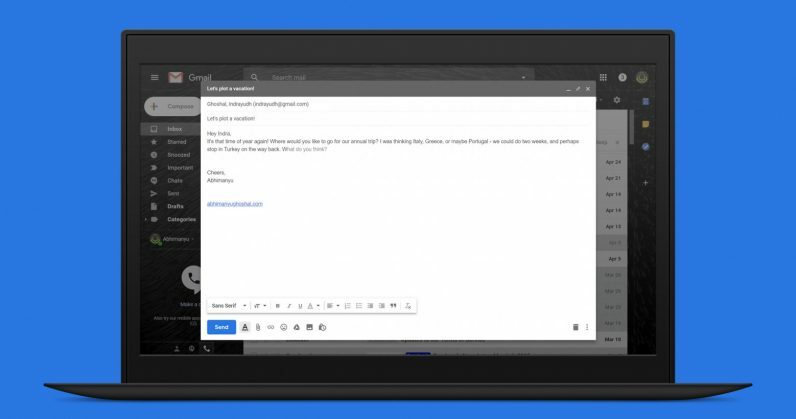 Its Smart Compose feature for Gmail, which was demoed at the company’s I/O conference earlier this month, is now live, and you can try it now (or soonish). It works by suggesting words and phrases that it can autocomplete for you as you type (just hit Tab to accept each suggestion), and it works for new messages as well as replies. To try it, you’ll need to click the gear icon in your Gmail inbox, then click on Settings, and then check the box next to ‘Enable experimental access.’ The feature could take a while to show up, but it worked for me as soon as I turned it on. G Suite users may not see the option, as it’s either not available to them at present or is controlled by their domain administrator. However, it’s not really writing your entire email for you; at best, it’ll save you several keystrokes per message, as it won’t try recommending entire sentences or pull information from the sender’s original message. We’re also yet to see the sort of AI smarts that Google perfected with its Smart Reply feature, which brings buttons for concise, contextually relevant responses to the messages you receive. I use that a lot, and I’m glad it’s now available in Gmail’s desktop web app for quickly getting through my inbox. Still, Smart Compose is presently labeled a work-in-progress, and hopefully, it’ll improve over time, and as more people use it.